From the Swahili meaning 'North Wind', Kaskazi Kayaks And Adventures is a dedicated sea kayak and adventure centre, situated in the heart of Cape Town, South Africa. Coastal Kayak Trails, the showroom for Kaskazi Kayaks and base for guided sea kayaking trips, had been trading successfully since 1995 from its beachfront premises at Three Anchor Bay, Cape Town, South Africa. Delivering Epic Kayak experiences and kayaks for over 15 years. Kaskazi Kayaks, the kayak manufacturing company, enjoyed a highly respected track record as a proven leader in design and quality workmanship to the highest specifications. We were greeted by friendly and experienced staff. The introduction with safety features were inform... - Sarel Greyling. Book things to do at Kaskazi Kayak and Adventures. 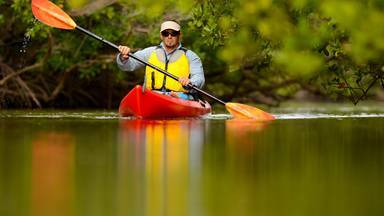 Find the best things to do at Kaskazi Kayak and Adventures. What people say about Kaskazi Kayak and Adventures. We were greeted by friendly and experienced staff. The introduction with safety features were informative. As we got ready to embark the kayaks, we had a clear idea of where we were heading. The first couple of hundred of metres was a love/hate man/kayak experience, but as soon as we got the hang of a rowing rhythm it was love at first sight. Not to mention the views and what was lying ahead. The spectacular scenery of Table Mountain took our breaths away. Feeling somehow safe on a little vessel on the open seas was liberating. Incredible delicate and rare blush pink jelly fish of various shapes accompanied us for a big part while on the ocean. This was a highlight. We furthermore were greeted by penguins and the stunning splash of pairs of dolphins a few times. Me and my son together with a friend and his son had the most memorable Saturday early morning out. Thank you Kaskazi Kayaks! We had an amazing experience.... Thank you. We had wonderful guides Mia and Reo who were enthusiasric and very knowledgeable. We can't wait to have another trip with you. 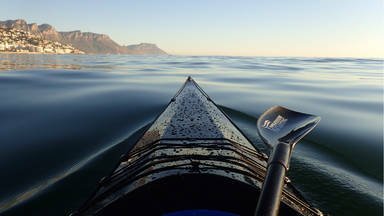 Very nice and relaxed canoe trip off the coast of Cape Town. We would book again anytime. Especially the dolphins were a highlight.